This postcard above says, “We are sisters. If I am mad at someone, you are mad at them too. 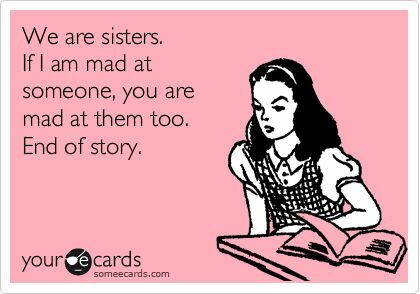 End of story.” made me live with two separate lives because I have 2 sisters and one of them is mad at the other. I couldn’t choose a side, I thought I could but couldn’t. I am the eldest and I use to be the strict and their enemy for being bossy. They used to be best of friends and then the middle child married somebody we really couldn’t approve of and the youngster was crazily mad. I couldn’t understand how 2 people I both love couldn’t love one another further to look beyond things they couldn’t control. Love is really about appreciating that a rose has thorns; wait let me elaborate a single rose has so many thorns. It should be in our vocabulary to be kind, be forgiving, and unless the person is not a family member or a truly dear friend we couldn’t be part of, should be endured to keep the relation last a lifetime. Hating will only torture and bruise the heart. I pray that baby sissy will soon realize her other big sissy loves her. One day and forever. My sissies made up and today in our group chat there were funny exchanges. Ahhh love, thank you for entering into our family space.